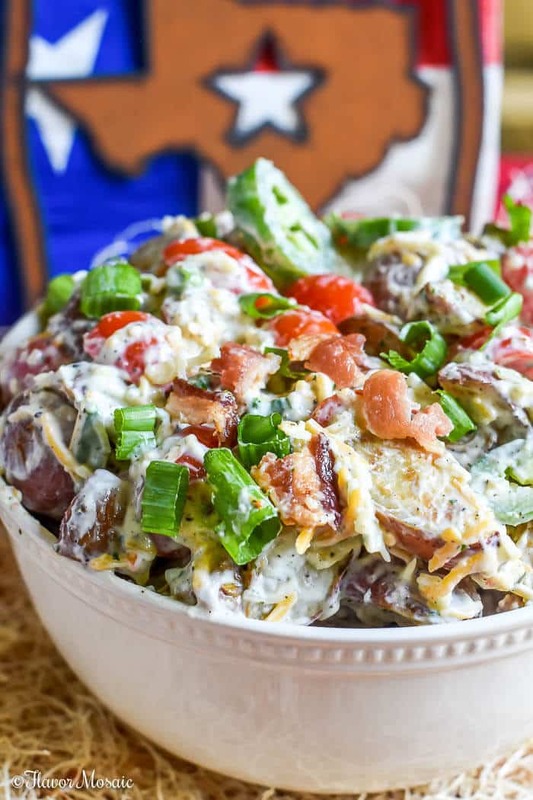 This Bacon Ranch Potato Salad adds bacon and ranch to this potato salad that is made with roasted potatoes and jalapenos for a Texas twist on your favorite picnic dish! 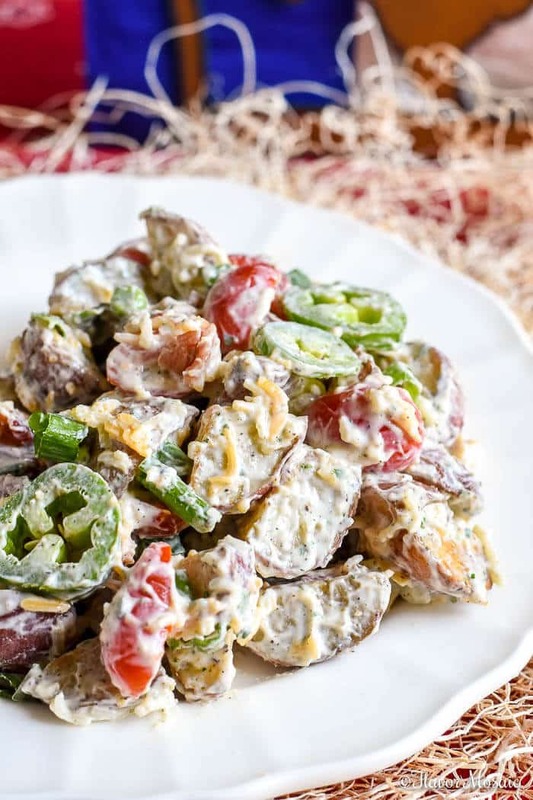 One of the reasons I love summer is because I can make this Bacon Ranch Potato Salad ahead of time and take it to our neighborhood block party, or church potluck, or picnic, or any gathering. I guarantee you that you won’t have any leftovers when you leave the party! The first two reasons that this potato salad tastes fantastic is because it has bacon and the dry ranch dressing mix for flavor. There is no need to say anything more. I probably had you at bacon! However, I take this Bacon Ranch Potato Salad over the top by roasting my potatoes instead of boiling them. It brings out the earthy richness of the potatoes and adds so much flavor. This way you can introduce even more flavor into the recipe. I used this roasted potato recipe. You could leave it there. I mean, roasting the potatoes, adding bacon and ranch seasoning, that would be great. But noooo! I can’t stop there. I have to add that Texas twist and add a little heat with sliced jalapenos! Of course, if you don’t like the heat, just leave off the jalapenos. That would still be delicious. You can add some chopped green onions for color. 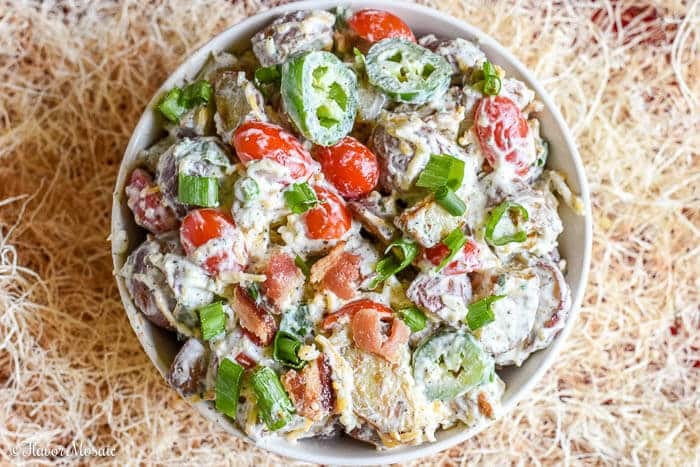 David has proclaimed this Bacon Ranch Potato Salad his favorite potato salad. He added more jalapenos to his serving. Of course, stir together the mayonnaise and sour cream with the ranch dressing or seasoning mix to make the creamy dressing for the potato salad.I love to make it ahead of time and refrigerate until you are ready to serve. That gives the flavors time to really develop. See the printed recipe below for all the amounts of the ingredients. 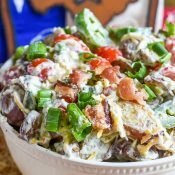 Whether you love bacon, or ranch dressing, or jalapenos, you will love this Bacon Ranch Potato Salad! Go ahead and give it a try for your next get together. Then go ahead and leave me a comment to let me know how you liked it! If you like this recipe, be sure to check out my other bacon ranch recipes. Preheat the oven to 400 degrees F. Cover a sheet pan with foil and spray with cooking spray. 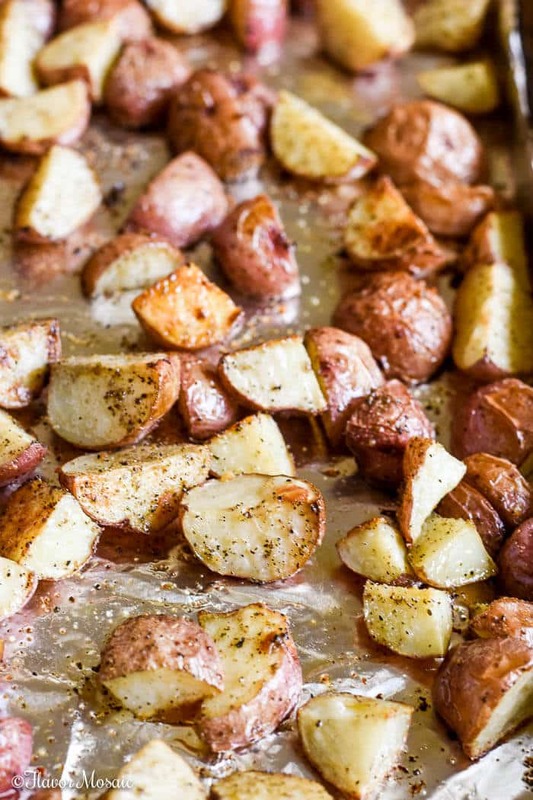 Place the quartered baby red potatoes in one layer on top of the foil-covered sheet pan. Bake for 20 minutes, turn the potatoes over and bake for another 20 minutes. Remove from the oven and let cool. Place the cooled potatoes in a large bowl. In a small bowl, stir together mayonnaise, sour cream, and ranch dressing mix. Spoon the ranch dressing into the large bowl with the cooled roasted potatoes. Add the shredded cheese and stir. Add the cooked bacon, baby tomatoes, and jalapenos to the potato salad and stir until evenly combined. Top with chopped green onions.